SALT LAKE CITY — As it made its way through the Utah Legislature, Salt Lake City leaders condemned the bill that would create a Utah inland port authority, sounding off alarms that it would usurp city land use decisions and capture an absurd amount of tax increment. 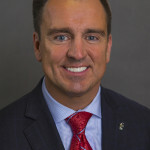 But House Speaker Greg Hughes — who spearheaded SB234 in efforts to establish the Utah Inland Port Authority before the end of his final term this year — is firing back at the city, claiming that while he was “getting hammered over usurping land use control,” the city in its own inland port development agreement gave away a long list of concessions to developers. Hughes’ criticisms come as Salt Lake City and state leaders gear up for a special session to reconcile their differences over how a future Utah inland port development will be controlled. Hughes, R-Draper, also says it’s “fundamentally not true” that the inland port authority usurps land control, arguing that SB234 “memorializes” city land use control in language stating the authority shall respect existing land use and agreements with property owners. “I can only take being falsely accused for so long,” the speaker said. Yet city officials stand by their argument that the port authority’s appeal process allows the board to overturn any city land use decision. Hughes, who scoured provisions in the city’s northwest quadrant development agreement in a recent interview with the Deseret News, accuses city leaders of being not just “hypocritical” of the state in their concerns about the Utah Inland Port Authority, but reckless in their concessions to developers for about 4,000 developable acres in the city’s northwest quadrant meant for the inland port. A development agreement is between the city and two of the northwest quadrant’s largest landowners: Rio Tinto Kennecott and NWQ LLC. Provisions of the agreement Hughes criticized include a 40-year term, no set schedule for the property’s development, no explicit requirement to actually create an inland port, and a provision he said would “lock in” current city land use laws for the next four decades. “I would argue that the public purpose and the taxpayer dollar is more protected under the governance of the (Utah Inland Port Authority) than the handful of developers that have been given complete control for phasing, implementing and land use for 40 years,” the speaker said. But city leaders — and landowners participating in the agreement — disagree. Salt Lake City Mayor Jackie Biskupski and other city leaders came to the defense of the development agreement, saying the speaker is drawing comparisons between two incomparable issues: a city-created project area — managed according to city laws and processes — versus an unprecedented government board that would have total control over multiple taxing entities’ tax increment, as well as the power to take appeals for city land use decisions. “To say they’re somehow the same, they’re not even remotely the same,” Biskupski said in a recent meeting of the Deseret News and KSL editorial boards. Salt Lake City Council Chairwoman Erin Mendenhall said unlike the Utah Inland Port Authority — which does not have a set of tax increment standards to dictate how decisions are made — the city’s development agreement requires developers to adhere to a public process through “every step” of development, whether it’s the city’s Redevelopment Agency board for tax increment or the City Council for land use decisions. The city’s Redevelopment Agency would also only capture 75 percent of the project area’s tax increment, while the remaining 25 percent would automatically go to the city’s general fund. Of the project area increment, 70 percent can be used for reimbursement to developers. In contrast, the Utah Inland Port Authority has the power to capture and distribute 100 percent of the tax increment in more than 20,000 acres in the northwest quadrant, as well as areas in Salt Lake County, West Valley City and Magna. “This is a public process where there are elected officials accountable for every dollar,” Mendenhall said, whereas the Utah Inland Port Authority’s board membership is made up of a minority of elected officials and, in its current form, isn’t bound by land use laws because of its appeal power or any standards to dictate how or where tax increment is spent. After Gov. Gary Herbert signed SB234, he directed legislative leaders to call a special session sometime this spring to address key city concerns, including land use authority, whether the port authority should capture 100 percent of the tax authority, whether Biskupski should have an appointee on the board, and boundary changes. Mendenhall and Biskupski say the 100 percent tax increment provision remains a big concern city officials hope will be addressed in the special session. But Hughes said Salt Lake leaders “act like this is all win or lose,” and “there really was, honestly, this attempt to find common ground” during the session. Hughes said he didn’t read Salt Lake City’s development agreement until after the 2018 special session — but after he did, he said he realized why developers would be “very happy” with its terms. “But as a public policymaker, it brings me pause and great concern,” he said. In addition to concerns over the agreement’s 40-year term and language locking in the city’s current laws, Hughes said the agreement lays out no project schedule requirements — or even the requirement to actually create an inland port. Hughes also questioned why city officials balked at a 5 percent or 2 percent allocation of tax increment for the port authority’s administrative costs (which were included in previous versions of SB234), but included a 10 percent increment allocation in their development agreement for the city’s Redevelopment Agency administrative costs. He said that, too, was “inconsistent” with the city’s complaint of the inland port authority. Additionally, Hughes pointed to another section of the agreement, titled “Most Favored Nation,” that provides that if an adjacent property receives a zoning use or entitlement not included in the city’s current law, the city will work with the developer to obtain the same use or entitlements. Hughes’ general counsel, Bob Rees, analyzed the document compared with a rough sampling of 12 other development agreements — five from Utah and seven from out of state — and found none of those agreements had a similar provision. Rees’ analysis also found that other agreements ranged from 15 years to 30 years, none addressed the applicability of future laws, and all either referenced a specific schedule of development the developer is held to or included a provision that the agreement would terminate after a certain period of time if the developer doesn’t make substantial progress. Lara Fritts, Salt Lake City’s economic development director, and Katie Lewis, a city attorney that helped draft the agreement, said the development agreement (passedby the City Council in January) is not “unprecedented” and not filled with giveaways to developers. Instead, they said it’s a balanced agreement on a unique 4,000 acres of land that face steep development challenges. And it does not give developers “complete control,” they said. “We have not been irresponsible. We have not been hypocritical,” Fritts said. Lewis noted that some provisions inside the agreement were modeled after the terms in South Jordan’s agreement with Kennecott on the more than 4,000-acre Daybreak development. Fritts and Lewis addressed each of the sections Hughes criticized, noting that the “Most Favored Nation” provision and the language defining the city’s current laws were modeled after the Daybreak agreement to provide developers with “certainty and predictability” as the property is developed. The agreement’s 40-year term is appropriate, Lewis said, because “it will take many decades” for the property to be developed because of its lack of infrastructure. Four decades is “completely reasonable,” Fritts said because of the years it will likely take to actually bring 4,000 acres of development online. Danny Walz, CEO of the city’s Redevelopment Agency, said comparing the 10 percent for administration costs was also like comparing “apples and oranges” because it’s a percentage from one taxing district in a much smaller area, whereas the Utah Inland Port Authority’s jurisdiction would capture increment from multiple taxing entities in more than 20,000 acres. “The city is not in the business of forcing private property owners to develop when business conditions will dictate how and when each phase of (the project) is developed,” Lewis said. She also said the concern that the developers won’t actually build an inland port is “misguided” because the property owners in connection with the development agreement requested specific changes to the zoning in order to facilitate a development of an inland port. “That handful of developers own the property. And they have the right to develop their property just like any other private property developer in the city,” Lewis added. The landowners who entered into the agreement with the city — Rio Tinto Kennecott and NWQ LLC — say the development agreement isn’t a “sweetheart deal,” but rather a balanced agreement that acknowledges it will take a massive amount of investment from landowners to develop a property that is infrastructure-barren and riddled with environmental challenges. Lance Bullen, spokesman for NWQ LCC, which represents various landowners in the northwest quadrant, also said the agreement was reached with the city to “facilitate the development of the inland port on land that is unimproved, with challenging site conditions, and far from any infrastructure and basic improvement.